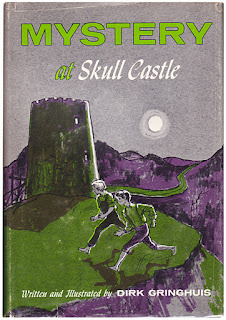 Seeing Dirk Gringhuis’s 1964 Mystery at Skull Castle in David Maxine’s collection made me curious about it. Fortunately, David has already shared a thorough review that answers nearly all my questions about the book and its connections to the Oz series. The boys [Bram and Piet] are secretly saving money to purchase a new buggy for Piet's uncle. They move their savings to the old burnt-out castle for safekeeping. While at the castle they find a stash of jewels and seconds later meet Major Willoughby, supposedly the long lost heir to the man who built the castle, and his East Indian servant, Singh. The Major cons the boys into leaving their money in the same niche that the jewels were in and tells them to keep quiet about the discovery. . . .
Bram and Piet are stupid and oblivious. They are gullible to every idiotic suggestion and notion the Major tells them. They ignore the truth even when little Bertram is telling them flat out he just watched the Major steal the jewels. Even after they manage to escape their bonds in the castle they don't run for help in town but allow themselves to be cornered on the shore of Lake Michigan where they cower until Piet's uncle solves the mystery (he recognized the red mud of the castle grounds on the major's wagon wheels) and comes down to the shore where he hears the commotion and shoots the Major. In a children's mystery, shouldn't the main characters be the ones to find the solution? Not only do Bram and Piet not solve the mystery, their primary goal at the beginning comes to nothing, since the uncle has no interest in a new buggy.